Description: Tall tussock-forming perennial. Culms stout, 80–200 cm high, 3–10 mm diam. Leaves flat, recurved, scabrous, as long as culms; ligule narrow, papery; sheaths pinkish to brown, dull or with some shining patches. Inflorescence big, erect to spreading, with relatively long lax branches, 50–125 cm long, with 10–14 nodes. Spikelets 2-flowered. Glumes 12–17, the lowest 7–10 glumes much shorter and mucronate or split apically, brown to dark grey-brown, glabrous, with apex of upper glumes obtuse. Stamens 3–6; anthers 1.3–2 mm long excluding apical appendage c. 0.2 mm long. Style 3-fid. Nut ovoid to ellipsoid or rarely obovoid, obscurely trigonous, 2.5–3.0 mm long, 1.5–1.8 mm diam., smooth, reticulate, shining, orange to red. Distribution and occurrence: Coastal districts, extending inland to Blue Mtns and to Braidwood area. Grows on creek banks and near swampy areas. 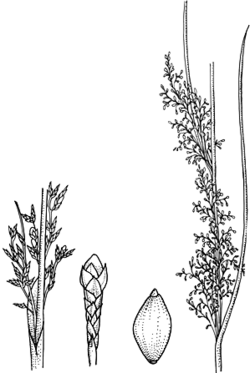 Differs from G. grandis (the only other species with numerous short glumes at the base of the spikelet) in the nut shape and size, anther length, length of stamen filaments, and inflorescence form.